Dr. Ramon Vilalta, M.D. 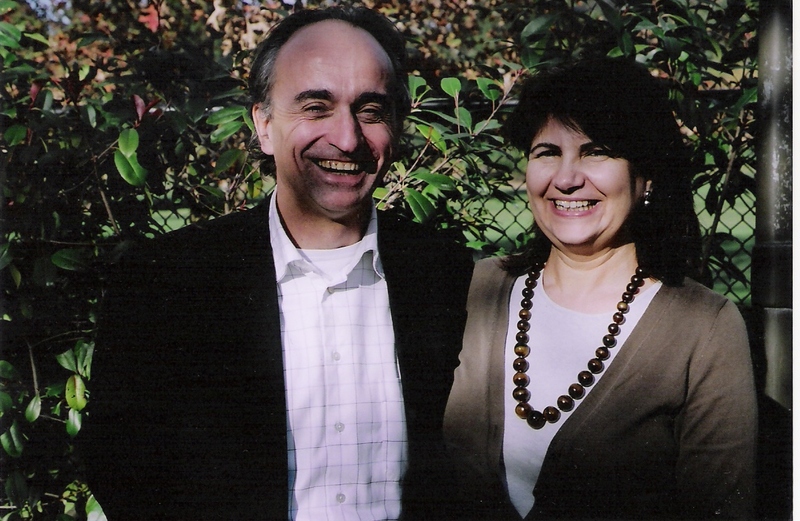 and his wife Deborah Hap while in San Francisco, Calif.
Ramon Vilalta, M.D. specializes in pediatric nephrology at the Hospital Vall d’Hebron in Barcelona, Spain. Last fall he and his wife, Deborah, visited San Francisco. Dr. Vilalta attended a nephrology conference and the couple traveled to Sydney, Australia where he undertook work at Royal Prince Alfred Hospital. Mrs. Vilalta is a journalist in Barcelona, who writes about health issues. While in Australia, Dr. Vilalta examined how Australian physicians approach kidney transplantation, and the protocol used both before and after transplant surgery. He specifically focused on transplant procedures for cystinosis patients. At the present time Dr. Vilalta’s practice in Barcelona is treating ten patients with cystinosis. Thirty-five years ago his team was the first team to diagnose a patient with cystinosis in Spain. His former colleague, Dr. Callis, now retired, established the pediatric nephrology clinic there and performed the first kidney transplant in Spain. “We are the most active kidney transplant practice in Spain, performing 15-20 transplants every year. In thirty-five years over three hundred transplants have been performed. Our ultimate goal for patients with cystinosis is that they receive treatment that will preserve their kidneys and thus not have to have a transplant. This is our goal,” says Dr. Vilalta. “Some of our patients have already received a transplant. In these situations, before transplantation, we must take care of their growth and treat complications. When kidney function declines, we prepare for transplantation. Our goal is to avoid dialysis if transplantation is necessary,” explains Dr. Vilalta. Approximately fifty percent of his patients are from Latin America, Eastern Europe and North Africa. “We must diagnose cystinosis early in life and begin treatment early as well,” he adds. “We have found there are different penetrations of cystinosis and it varies with each individual. The amount of disturbance is quite variable. It is very important for patients, families and physicians to work together as a team, in order to support the patient in adhering to the treatment regime. Sharing experiences and knowledge with others, including our international community, is vital,” he says. “For instance, we have found from experience that freezing pills before ingestion helps immensely. We don’t know why this is so. We just know that it makes it easier for a child to take the pill. This is just one piece of information that is very helpful to share with others,” he adds. Dr. Vilalta serves as a consultant for the Cystinosis Foundation in Spain and volunteers his expertise by answering questions posted on the Cystinosis Foundation, Spain, web site. Dr. Vilalta recently attended the 5th International Cystinosis Congress in Dublin, Ireland. This conference is an excellent opportunity to hear from researchers and other physicians in the field, as well as serving as a comfortable environment to meet families and individuals and to share experiences. Cystinosis Foundation of Ireland, Cystinosis Foundation, Orphan Europe, Sigma-Tau and AIRG are sponsors of this biannual event.